The look Lane gives Don when Don says "I've started over a few times... This is the hardest part." just screamed "It's easy for you Don, you have know idea how hard it is for me." 1) The inability to be happy... Don's speech to the Dow brass is almost a summary of why many of the Mad Men characters can't be happy. They have it all, but can't enjoy it, they want more. 2) Lack of Communication leading to larger problems... If Lane could have overcome his own programming and expressed to Don or even the other partners his tax problems, they might have been willing to help. In fact, Lane already knew that Don is willing to help people out with money as Lane was the only partner that knew that Don paid Pete's share. The black comedy involving Lane and the Jaguar was sublime. Lane asks his wife how she paid for the car. Her reply: "I wrote a check." And of course, the Jaguar's legendary electrical system problems coming at just the right moment, or wrong moment, for poor Lane. 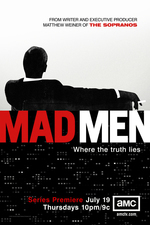 The inability to be happy... Don's speech to the Dow brass is almost a summary of why many of the Mad Men characters can't be happy. I always had a hard time buying into the events that lead to Lane's suicide. How is it plausible that Lane thinks he can forge a cheque and the other partners won't notice? I also can't see how Lane wouldn't think he could go to Don. Cooper's initiative in looking into the books is what reveals Lane. A pity he doesn't have something better to do. And Cooper wouldn't have checked the books if Jaguar wouldn't have asked for a different payment structure. If not for that, the only people that would have checked the books were Lane and maybe Joan. Yeah, I can absolutely buy that Lane was desperate enough to do it and went through with it because it seemed fool-proof. He would have got away with it, if not for that pesky Jaguar! Also, Lane thought that they'd be getting bonuses soon enough, so at the time he forges the check it wouldn't have mattered. No one was going to go back and compare the dates to see that Lane's bonus came two weeks earlier than the rest. It's also completely plausible to me that Lane's pride would keep him from asking the other partners or Don for a loan. I love that Kenny is staying out of Dow, except to demand that he be put on it anyway. And that Pete can't get a whiff of it.